When I found this app in the iTunes App Store, I was excited to try it out. I loved the “Choose Your Own Adventure” books as a kid, and was excited to see what they had to offer. I downloaded the app and set out to read my first story. I was surprised to find that there are not really any complete stories available at this time. However, there are sample stories and puzzles there to show you what the app can do. 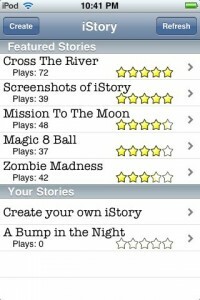 The real value of the app comes in its ability to help you create your own “Choose Your Own Adventure” stories and share them with other iPhone and iPod Touch users. To create your own story, you tap “Create your own iStory.” The app then asks for your email address. After entering your email address, you receive an email with a registration link. You click on the link and it takes you to their website where you can create your own stories and then submit them for review. The iStory team reviews and approves each story before it is released to others. This process also links your iPhone or iPod with your iStory account so that the stories that you are working can be read on your device before they are submitted for review and publishing. The only real goofy thing that I ran into in the setup process was that it didn’t seem to matter what email address you gave them to start with, you cannot login into or use the website without having a Google email address. When you log in there is a disclaimer from Google saying they are not affiliated with iStory, but why the Google email address requirement? Luckily, I had one already set up and could proceed. At first, I did not know where to start. When I clicked on the help link at the top of the page, I found detailed instructions on how to get started on a story. The actual creation of the story was pretty easy. I did make a couple of mistakes early on that took some thinking to work past, but eventually got it all straightened out. You start your story by creating a cover with or without a picture. From there you start typing your story. When you get to a spot where you want to place a fork in the road, you click on add a choice and enter the text for that choice. You can use as much text or as many pictures as you want. A story of this type presents a unique challenge in keeping track of the pages and where they go and come from. The interface that iStory offers helps you keep track of the pages with a drill down type menu on the left hand side of the screen. Each time you add a choice to a page, the program cues up that choice as a page in the drill down menu that needs text. You can navigate from one page to the next by clicking on a page in the drill down menu. To check your progress and make sure you are doing everything right simply click on “Play Story” and you can see your story as it would appear on your iPhone. Or you can click the refresh button in the iStory app on your iPhone. Your story will then appear on your phone and be available to download. You can share your story with others at any step in the creative process. When you share your story with someone, you can give them reader, author, or admin status. As a reader, they can only read the story. As an author, someone can add to and delete from your story in a collaborative effort. Admin status allows them full access to the story. When you are finished with your story, you can submit it to iStory for review. Once approved, your story will be available to other iPhone and iPod users to read and enjoy. I wasn’t so sure about this app until I actually went through the process of creating a story and downloading it to my phone. It was fun and kind of neat. This app is a great one for encouraging kids to write and be creative. What kid wouldn’t like to see their story being published and enjoyed by others? This app is not only for kids, though. 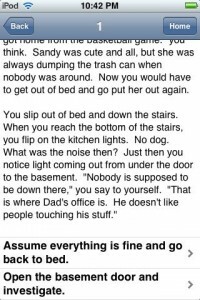 It is appropriate for people of all ages. I think the app will only become better as more and more stories become available for reading. It was only just released Feb. 4th and needs some time to grow. iStory is in the iTunes App Store for $2.99.